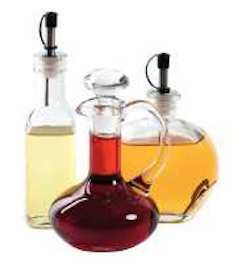 Check your kitchen pantry and you will probably find a bottle of vinegar. While this substance can add much-needed tang to favorite recipes and even improve the leavening function of some baking ingredients, its power extends far beyond the kitchen. Around the bathroom, use vinegar to remove soap scum film from shower doors and tile surfaces. Remove stubborn toilet bowl stains as well. Corrosion and hard water can clog showerheads, and by soaking the shower nozzle in vinegar overnight, you can dislodge any material. Vinegar makes an effective weed deterrent and can kill grass that grows between the cracks on sidewalks and driveways. Acid-loving plants, such as rhododendrons or azaleas, can benefit from a little vinegar mixed in when watering. Some people say that vinegar can be used as an appetite suppressant. Using it on prepared foods may help you to eat less. Vinegar is handy for relieving the pains associated with sunburns and jellyfish stings. Dot irritated areas with vinegar to relieve pain and itching.